Several years ago in the days before YouTube, there was a viral video in the running forums of Ato Boldon doing a 60 inch or 1.50m box jump (approximately, video below). The height of the box reaches Ato’s neck or chin. Obviously, people confused this with the vertical jump or vertical leap test, but it is still a good indication of explosiveness. Then there was Dwain Chambers doing a 64 inch box jump (approximately, video below), and this was jumping onto those flimsy plastic “Aerobic Step” steps from the 1990’s. Dwain is 5 feet 11 inches or 1.80 meters tall, and you can see in the video the relative height when he stands next to it. The top step reaches his nose. As Charlie Francis would say, it’s better to jump 7 feet once, than to do 7 one-foot jumps. In both cases, they are over 5 feet high. I am a firm believer in plyometrics, and I will choose plyos over weight training any day, especially with younger athletes. Tom Tellez, Carl Lewis, Kim Collins, Alan Wells, and Daley Thompson all share the same sentiments. My personal stance on this is you should try to incorporate BOTH weight training and plyometrics in your training routine. Thanks to Tomas for sending this picture of Jeremy Wariner doing his usual pre-race routine. Based on rough calculations, on a standing “tuck jump” (as opposed to Ato Bolden and Dwain Chambers using a running jump), we see JW capable of jumping at least 110cm, maybe over 115cm… that’s over 3 and half feet. And he’s not even trying. Disclaimer: when doing box jumps, please consult your coach before attempting jumps higher than 36” or 1 meter. Very impressive. 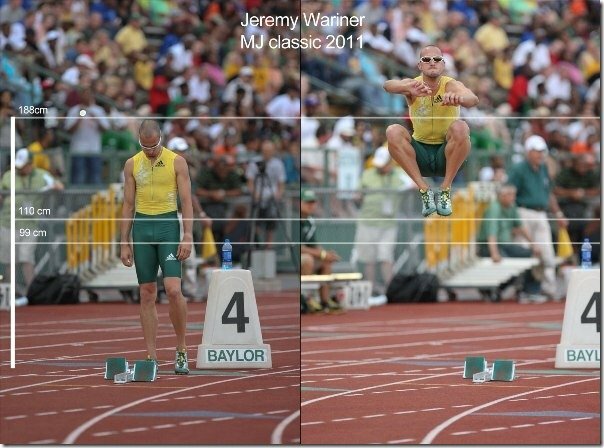 Another good test is to place a series (usually 3 or 5) hurdles about 7-8 feet (~2.1-2.4m)apart and take one jump over each hurdle – no bunny hops to gather yourself. I can still (at 37yrs) do 30″ (~76cm) hurdles – I will try 33″ (~84cm)next week. 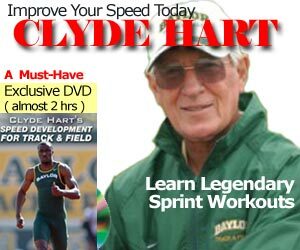 In my mid 20s I could do the 39″ (~99cm) hurdles and once got over 3 hurdles at 42″ (~107cm). As a high school coach, I use that jumping “test” during my indoor/winter season to identify explosive athletes and the kids like the challenge. I use a stack of folded gymnastic mats and keep adding mats until no one can clear. I have not ever measured the height but I will next winter!! Thanks for the article & videos. 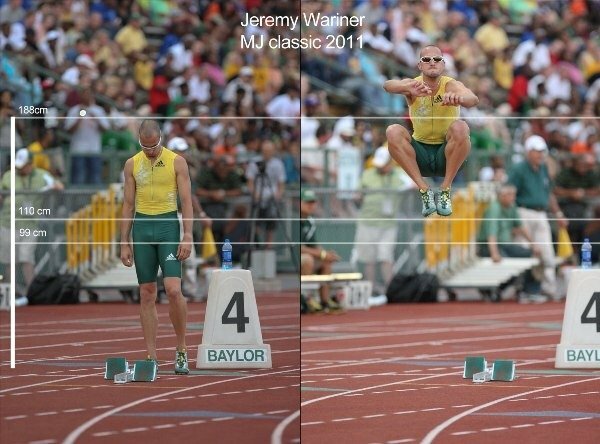 @marinov, yes, the edited photo of Wariner was simply to show hard it is to box jump 5 feet like Dwain Chambers or Ato Bolden. Of course, it is inaccurate, but nowhere near 5′ with a running start. The jump is impressive, but I’d like to see what Dwain can do from a standstill. I tried box jumping for the first time tonight. Hit 38″ from a standing start. I’m 5’9″, 173 lbs and 38 years old. Workouts are mostly weight lifting 3x per week and stairmaster 2x. Is 38″ good or normal?